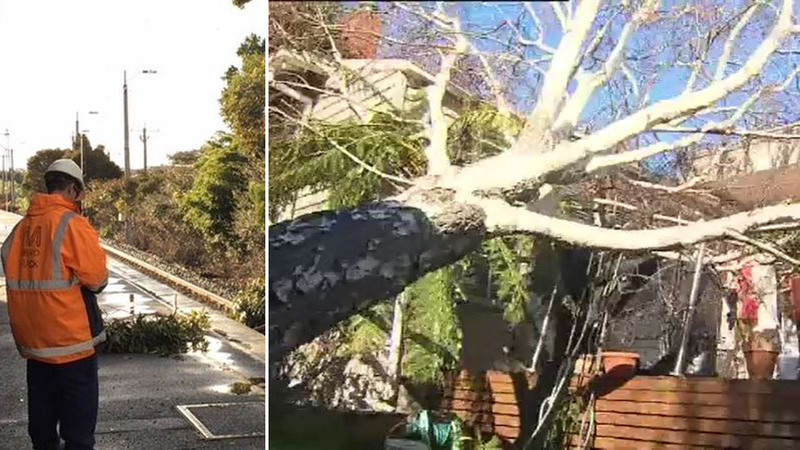 Clean-up efforts will begin in Victoria today after wild winds and intense storms battered the state yesterday, leaving a trail of destruction. Severe weather and wind warnings were issued for Victoria yesterday as a cold front swept across Australia’s east and brought wind gusts of up to 125km/h and heavy rain. Wind recordings at Melbourne Airport exceeded 91km/h, while in Ballarat peak gusts were above 100km/h and in Port Phillip they were higher than 125km/h. Victorians are facing a massive cleanup effort today after wild winds and intense storms caused destruction across the state. Picture: 9NEWS. Areas of the state’s west, such as Ballarat and Horsham, were worst affected by the storms with the cold front also causing the temperatures to drop to what felt like -7 degree conditions. To see your local weather, go to the top of the website and tap your postcode into the section "Your Location" or visit the weather page HERE. The State Emergency Service were kept busy throughout the wild weather, with 800 calls for help put through to authorities. The Victorian SES received 800 calls for help yesterday and overnight, mainly for fallen trees. Picture: 9NEWS. Trees had toppled onto cars, homes, power lines and train tracks but not major power outages were recorded. Picture: 9NEWS. Of those, 600 were calls for assistance to handle trees that had been uprooted onto cars, power lines and train tracks. Just five of the calls were calls for help in rescuing people from properties or car accidents. Yesterday Melbourne’s Metro Trains issued notices of delayed or redirected services, with buses also replacing some routes throughout the commuter peak hour rush. Melbourne's Metro Trains also issued notices yesterday to commuters in the peak hour rush after services had to be redirected or replaced by buses. Picture: 9NEWS. The worst of the weather has passed for now, however another cold front is expected for the end of the week which should bring more rain. Picture: 9NEWS. Luckily, trees that had fallen onto electricity wires did not cause any power outages. The SES will also be working to assess building damage across Victoria today after 190 of the calls put through to emergency services yesterday were for structural issues. In Marysville, north-east of the Melbourne CBD, a nine-year-old boy was taken to hospital after being trapped underneath a tree that had fallen on him. He suffered no significant injuries but is still recovering in hospital. The Bureau of Meteorology has cancelled the weather warnings that were issued for the state yesterday, however wind warnings still remain in parts. The worst of the cold snap and thunderstorms has now passed over Victoria and a day of sunshine is forecast for Melbourne today, despite winds of up to 45km/h. Acting Deputy Chief Mark Cattell of Victoria SES told the Today Show that authorities are now preparing for tomorrow and early next week ahead of the approaching weather and urged residents to ready themselves. "Please have a look around your yard, make sure you secure any loose items," he said. "When you&apos;re in those sorts of winds, don&apos;t park under any trees and when you&apos;re driving on the roads, just be aware of your surroundings because trees do fall across roads often."